The Russian hairstylists love the new Parlux ADVANCE®! 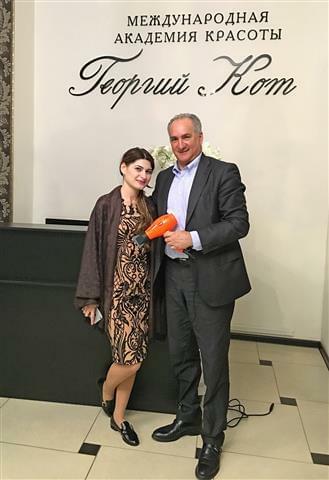 Since its first official presentation at Cosmoprof Bologna 2016, the new professional PARLUX hairdryer, the Parlux ADVANCE® has been used by many Russian Stylists, in Soči, (Russian resort in Southern Russia) working in hair salons and by the important Academy of the famous hair designer, George Kot, a personality of the Russian and not only Russian, hairdressing world. George is in fact, a talented hairdresser who has obtained many awards over the years and who, in 2008, at the World Hairdressing Championship in Chicago, won two world titles, in the Fantasy and Cut category. The team of George Kot, receiving the new Parlux ADVANCE® for testing, reported enthusiastic comments about this dryer: “a professional, powerful dryer, extremely lightweight which permits very quick drying” very favourable conditions for good stylists to be able to express their best creativity without suffering from arm and shoulder pain. The Ceramic & Ionic device spreading negative ions which allows for healthy and shiny hair, the less noise drying and the different colour availability of this model, make the Parlux ADVANCE® a sought-after tool which will be surely the preferred one among the Soči hairstylists and not only them.